Travertine has a natural color variance. Natural Stone Has a Wide Color Variance. You Are Here: Home / The Blog / Learning Center / Natural Stone Has a Wide Color Variance. All of these pieces of Ogee are all Cappadocia travertine. As you can see there is a wide variance of color. One of the things that surprises a lot of people is that natural stone can have a wide variance in color. This is true for the tones that are more vibrant and rich, the softer tones that lean closer to white like Ivory are less likely to have noticeable variation. Yet no two tiles or pavers are exactly alike. Some colors like Leonardo can have a wide variance from white to charcoal with lots of reds and creams streaking throughout the stone are extraordinarily beautiful and although the colors are the same the pattern is far from it. 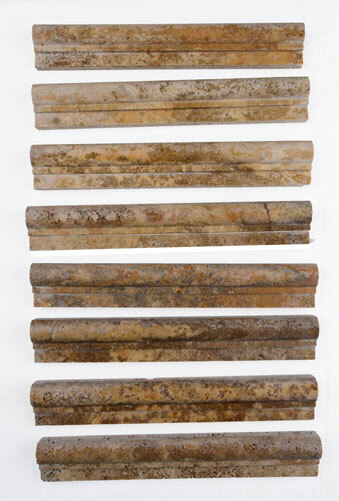 These stones are created by nature laying down layer upon layer of different materials. The material for travertine is calcium carbonate. In hot springs it precipitates and over millennia form into the stone we have today. There are a number of places in the world that travertine is found and harvested. 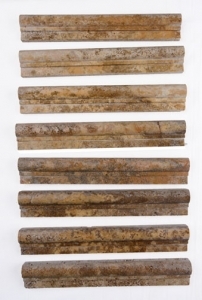 Stone-Mart travertine comes from Turkey.